Can I change button label so it can serve two functions? 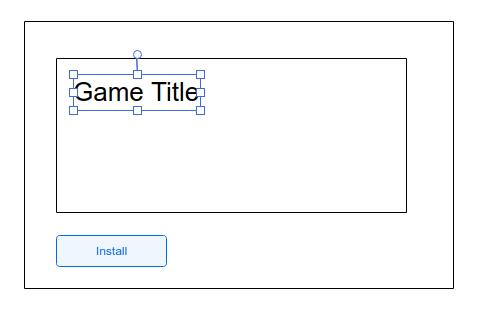 I need to design a game start screen, where there's a PLAY button waiting for the installation to complete. But the user has a possibility of stopping the installation which would result in a new screen appearing, where they can start the installation manually from the start. My question is if I can change the label of this PLAY button to INSTALL on the last screen, mainly to save some space or not to have to leave blank space for the other button to show up later (or never, if the user never stops the installation). Same I guess would be applied to an update screen and other that need some kind of loading that can be stopped and started manually again. I have updated my answer to be a bit better laid out and also to hopefully address your follow up questions. The following is a design that is seen in many game launcher/installers such as Blizzard's Battle.net, Warframe, World of Warhips, etc. 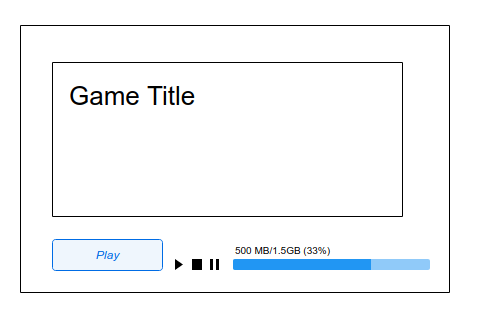 but it is important to note that during installation the 'Play' button will be greyed out, so the user cannot click it until the game has finished its installation. It is also from this view the user can control the installation - pausing, cancelling, or resuming (which were not relevant controls in the previous state). And finally when the game is finished its installation the view will replace all fo the installation controls with the now active 'Play' button, since that is the only control that is relevant once the installation has completed. It might also be a good idea to place a 'settings' icon in this state as well, so the user's can uninstall the game from here as well. The main reason why I feel that this is a clean design is because it displays only the relevant controls that the user will care about based on the games current state - needing install, installing, installed and ready to play - meaning there will a low cognitive load (they don't have to discern the meaning of controls since only the relevant ones are displayed). As for the implemntation details, that is more of my developer side coming out. It is not a nice design to have one element provide multiple operations or functions. So for implementation you can actually have two different buttons (one 'install' and one 'play') but you would only ever have one of the buttons be displayed at any given time. The one thing to note is that this is only a good idea if you can visually turn on and hide the buttons seemlessly from the user's point of view (so it looks like all that changed is the label). If the button shifts location or blinks or anything like that, it can be visually jarring and in that case it would be a better idea to just change the label as you first suggested (basically, the user's experience of the button/label change is more important than the underlying implementation I think). Not the answer you're looking for? 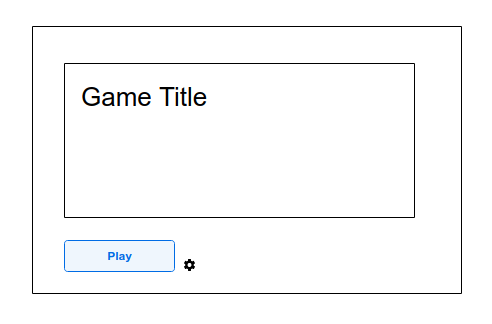 Browse other questions tagged buttons labels or ask your own question. Do I really need a login button? What design should I use to represent multi-touch video controls? Why don't ATMs show blank arrows for unused buttons? Confirmation of user input: inline button or popup/modal?